We all know that sun protection is important. I have a nice little scar front and center on my chest from having skin cancer removed. How I wish I could go back and show teenage me the scar and douse myself in sunscreen. Oh, and kick me out of the tanning salon! Anyways. It’s 2019 and we all know the risks of sun exposure. What’s incredibly frustrating is that now they’re saying that regular old sunscreen is just as harmful as sun exposure. To be clear, regular old sunscreen = chemical sunscreen. The problem with chemical sunscreen is that it is being absorbed into our bodies (our skin is our largest organ and incredibly absorbent!). The most dangerous of the chemical ingredients is oxybenzone. You can read more about the potential threats in that link, but it is the number one thing you should avoid in sunscreen. Don't Have Time to Read? Shop the Sunscreens Here! So if you can’t use chemical sunscreens, what are you supposed to use? Mineral sunscreens work in a completely different way than chemical sunscreens. Instead of absorbing into your skin (the way chemical sunscreens do), mineral sunscreens (also known as physical sunscreens) sit on top of your skin and reflect the UV rays. 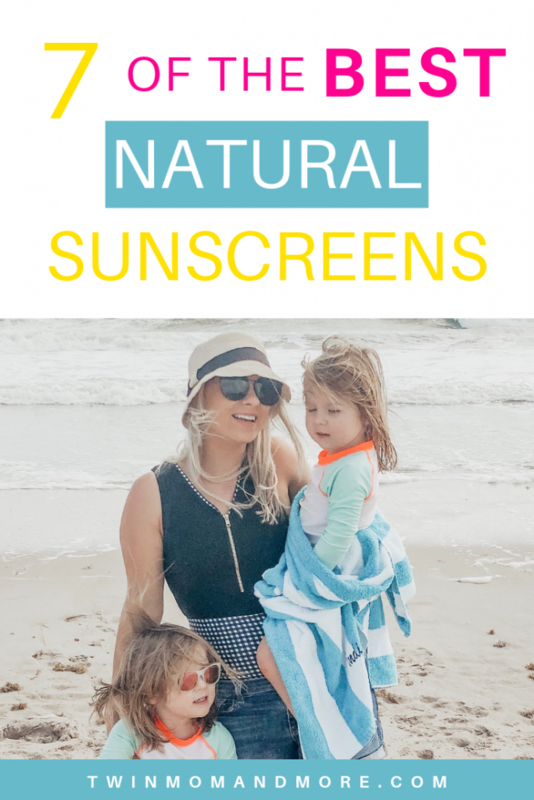 Mineral sunscreens are completely safe as a baby sunscreen. They are safe for kids and toddlers. They are safe for the entire family. 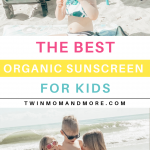 There is no need to buy a specific organic baby sunscreen if you are using a high quality, mineral sunscreen. All of the ones I have listed in this article are wonderful for babies. Active Ingredients: Your mineral sunscreen should only have the minerals zinc oxide or titanium dioxide listed as an active ingredient. Anything else listed means that it is a chemical sunscreen mixed with a mineral sunscreen. *Broad Spectrum Sunscreen: This means that it protects against both UVA and UVB beams. This is very important! Minerals NATURALLY offer broad-spectrum protection. *Water Resistance: If you are going to be sweating or swimming, make sure that the label says it is water resistant. It is not a given. *Non Nano Zinc Oxide: Nano particles enter your bloodstream through your skin. Non nano particles DO NOT enter your bloodstream. Every year, the Environmental Working Group releases a guide to the top non-toxic sunscreens. You can read their guide here. I always pour through the EWG guide and read lots of reviews before trying out sunscreens. Just because something doesn’t have harmful ingredients, doesn’t mean that it is easy to use. Or affordable! There is nothing I hate more than sunscreen that is difficult to rub in or leaves you looking white as a ghost. Or sunscreen that makes me look like a ghost AND costs $50 per bottle! There’s also the problem that many of the brands listed on the EWG aren’t available on Amazon or at Target. I’m sorry, but I’m not going to order something that I have to get from a specific website that I haven’t heard of. So, I figured since I have done the work of finding broad spectrum, mineral sunscreens that work, don’t turn you white, and are easily available, and don’t cost $50 a bottle, I should share them with you guys! Please note: If this is your first time using mineral sunscreens, they take a tiny bit of getting used to. They are different to apply than chemical sunscreens… but just think of how you are saving your body from harmful chemicals! A quick note on pricing: I’m not listing prices because they fluctuate so drastically. If you have a Target redcard, you can order many of these from Target and save 5%. They also go on lightning deal on Amazon occasionally. The most important thing to look for price wise is how big the bottle is. Some of them may seem cheaper but it is only for 3 ounces while other bottles are 5 or 6. MY FAVORITE!!! I love. love. love. 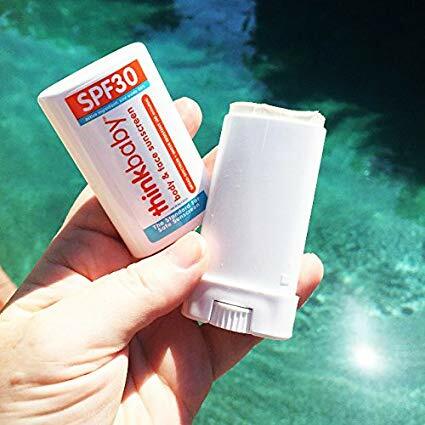 thinkbaby safe sunscreen. It rubs in really well so you aren’t white! You do have to rub it in more than a chemical sunscreen, but I have to rub less with this sunscreen than any other mineral based sunscreen. It also has a really lovely fragrance. It’s light and fruity and summery scented! It’s free of toxic ingredients and contains only pure protection. The ingredients to give it it’s scent include aloe barbadensis leaf, raspberry seed oil, cranberry seed oil, and sunflower oil. 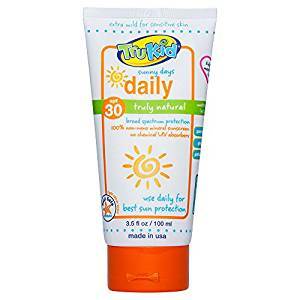 We have never burned with this sunscreen and it’s the best value I have seen. The 6 ounce bottle runs between $15-20 and it lasted our family of 5 an entire 5-day Florida vacation. Thinkbaby has 2 versions: Thinkbaby Sunscreen and Thinksport Sunscreen. The formulas are nearly identical and are both safe for babies. They made one called Thinksport because older children didn’t want to carry around a sunscreen with the word baby one it. They also have a sunscreen stick that I absolutely love. It’s brilliant for applying sunscreen to faces, ears, and the backs of little boys necks. Our entire family uses them both: whichever one is cheaper at the time of purchase! I love products that my entire family can use! It’s also available at most Target stores! TruKid is another fantastic option and one that my entire family uses. I will say that this leaves a little bit of a white sheen, but not ghost white. It has a pleasant scent and rubs in easily (for mineral sunscreen!). This brand is excellent for those with eczema or sensitive skin. Blue Lizard is another one of my favorites. In fact, if it was the same price as the Thinkbaby, it might win! It blends into the skin very well with no white residue and isn’t greasy! It doesn’t have a pleasant scent like the two above, but that’s a pretty low priority for me. The bottle also changes colors when it’s exposed to harmful UV light which is very cool! Badger sunscreen does a great job. I do personally feel as if it’s a bit pricey. Prices do fluctuate, so when you’re checking, be sure to check how many ounces you are looking at!!! This one is also on the thicker side of the mineral sunscreens I have listed here. 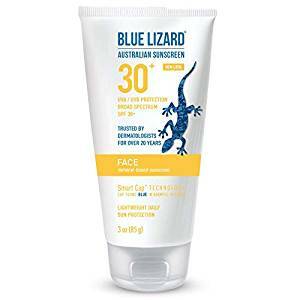 While it’s made with truly superb, organic ingredients, the ease of use and price point aren’t quite what the other sunscreens are. It is still an excellent choice, and widely available at Target and Amazon. 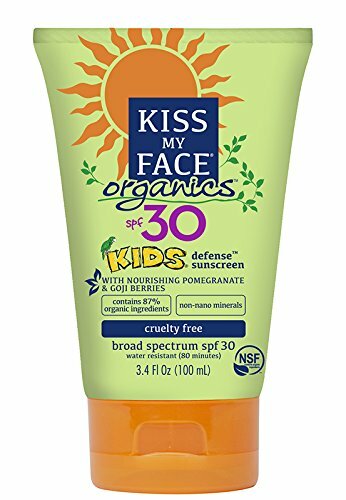 I have not personally used this version of Kiss My Face sunscreen, but I will try it before the end of summer and let you know! Reviews are mixed. Some say that it blends well and others say that you have to knead the bottle together (who has time for that?!). 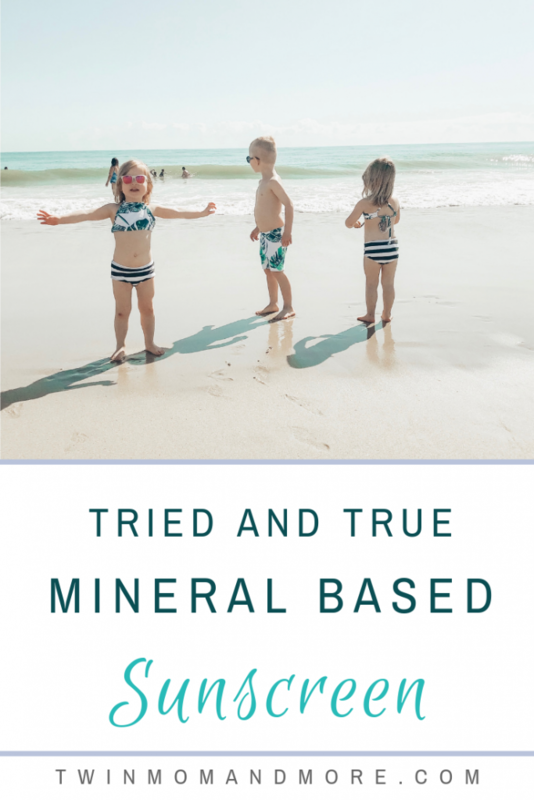 There are a few reviews that say it turns them white and streaky, but that does happen if mineral sunscreen isn’t applied well. Regardless, it is definitely a good sunscreen to consider. I purchased Garden Goddess at our local CVS and have seen it at many different stores. It is a better pricepoint than a few of the others I have on here. I used it on our most recent vacation and I was NOT a fan. It was extremely thick and chunky and took forever to rub in. However, reviews on Amazon are mixed. People either had the same experience that I did, or they raved about it. So it’s possible that they recently changed their formula! 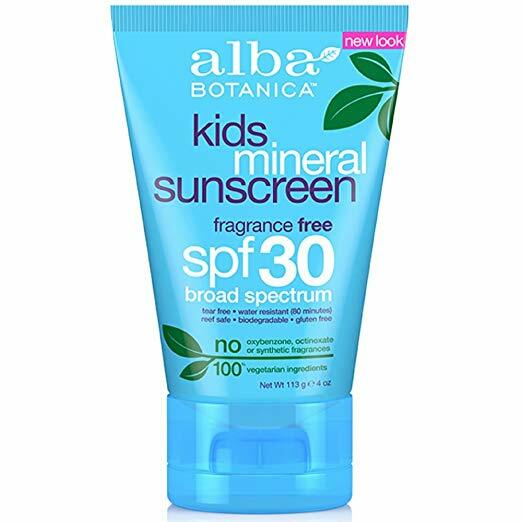 Alba Botanica is another sunscreen that is rated very well with the EWG, is a decent price point, has great reviews, and is readily available. I also haven’t tried this brand, so if you have, please let me know how it is! I wouldn’t hesitate to purchase or use this at all. To sum it up, Thinkbaby/Thinksport is my sunscreen of choice. I wanted to make sure I included a variety because things aren’t always available and people have different preferences. 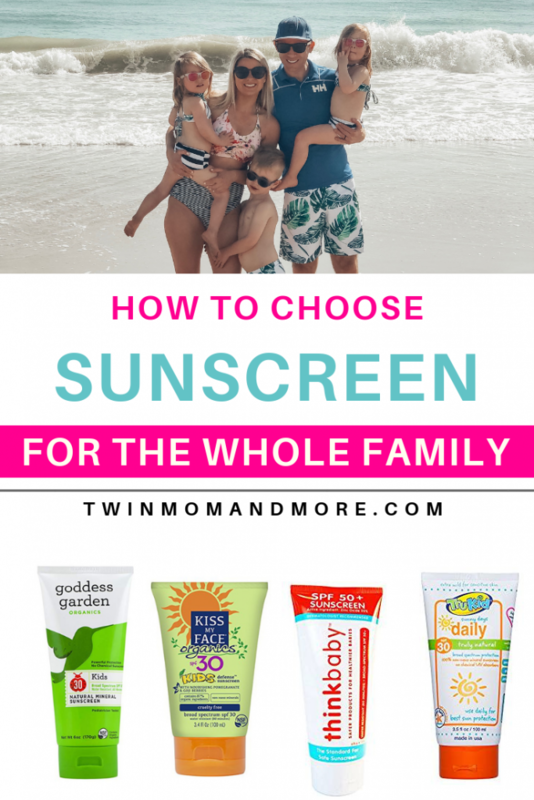 I’d love to hear what works for you and what sunscreen you use for your family! P.S. Make sure you’re following me on social media to keep up with our family and all the twin cuteness! 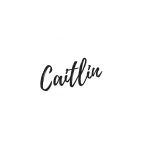 I am on Instagram, Facebook, and Pinterest!